Training on plant health surveys in Apulia under the “Better Training for Safer Food” initiative. Early this month, 33 participants (mostly plant health and phytosanitary inspectors) from 19 EU countries took part in a 4-day course in the Apulia region (Italy), to gather knowledge on the regulations on Xylella fastidiosa, with a specific focus on the field epidemic in the Apulia region. The activity is part of a wider program of activities under the “Better Training for Safer Food initiative” of the European Commission. From 5 to 8 February 2018 in Bari (Apulia region, Italy) a comprehensive training program on plant health surveys took place under the “Better Training for Safer Food” initiative of the European Commission. The training aimed to provide understanding of the key elements of the relevant International Standards on Xylella fastidiosa along with best practices for planning plant health surveys. 33 participants from different professional fields – researchers, phytopatologists, plant health and phytosanitary inspectors from international, national and regional organizations – were accompanied by EU representatives and tutors from major European research organizations. The participants came from a wide part of the European Union, with 19 EU countries represented. 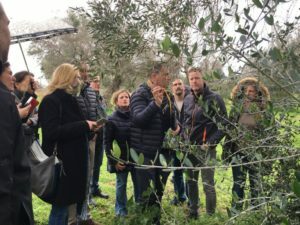 The visit was organized with the help of the local plant health service of the Apulia region, providing the information related to the specific site. 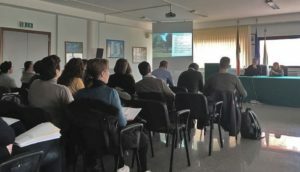 Implemented by AENOR and Agriconsulting Europe, the course was organized in two major sessions: an introductory lecture providing background information and current situation of Xylella fastidiosa, including damages, symptoms, distribution and means of spread. The second session focused on surveys, i.e. survey methodology, statistical basis for surveys, survey implementation, areas and host for prioritization, and best practice identification, reporting and procedures in case of finding, requirements for production and movement of plant material. The activity included a plenary session, group results presentation, discussion and Q&A. Afterwards, a field visit to the demarcated areas of Apulia allowed to gather practical knowledge on the symptoms, updates on sampling and detection (data recording, samples traceability and manipulations during the transportation), practical aspects on the management and measures applied in the outbreaks and demarcated areas. Moreover, practical issues on inspection were addressed, for instance “how to carry out inspections”. Juan Navas-Cortés of CSIC and Stephen Parnell of the University of Salford, both partners of XF-ACTORS project, were among the tutors addressing survey planning, statistical basis and principles for surveys and survey implementation. 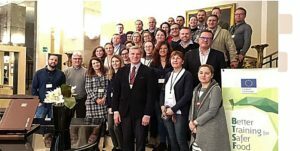 “Better Training for Safer Food” (BTSF) is a European Commission initiative aiming at organizing a Community (EU) training strategy in the areas of food law, feed law, animal health and animal welfare rules, as well as plant health rules. While the Commission sets policy and general strategy for Better Training for Safer Food, the Executive Agency puts into practice this initiative by managing all phases of projects, from launch of calls for tender to evaluations of offers, award of contracts, and supervision of implementation.